Velvet Buzzsaw is a 2019 American satirical supernatural horror film written and directed by Dan Gilroy and starring Jake Gyllenhaal, Rene Russo, Toni Collette, Zawe Ashton, Tom Sturridge, Natalia Dyer, Daveed Diggs, Billy Magnussen and John Malkovich. The film had its world premiere at the 2019 Sundance Film Festival on January 27 and was released on February 1, 2019, by Netflix and in selected theaters. In Miami Beach, art critic Morf Vandewalt attends an art exhibition alongside his friend, Josephina, who works for Rhodora Haze, owner of the Haze Gallery and formerly a member of the rock band Velvet Buzzsaw. Velvet Buzzsaw is a 2019 American satirical supernatural horror film written and directed by Dan Gilroy and starring Jake Gyllenhaal, Rene Russo, Toni Collette, Zawe Ashton, Tom Sturridge, Natalia Dyer, Daveed Diggs, Billy Magnussen and John Malkovich. The film had its world premiere at the 2019 Sundance Film Festival on January 27 and was released on February 1, 2019, by Netflix and in selected theaters. Morf is unfulfilled in his own love life with his boyfriend, Ed, and so starts a sexual relationship with Josephina. Returning to Los Angeles, Josephina finds a dead man named Vetril Dease in her apartment building, and enters his home to discover myriad paintings. Josephina steals the paintings to show to Morf and Rhodora, who become fascinated with Dease; Rhodora decides to exhibit some of the pieces in her gallery. Morf's art curator friend, Gretchen, and a former artist for the Haze Gallery, Piers, become equally enamored of Dease's work. The Haze Gallery exhibition of Dease's paintings is an instant success. Morf begins researching Dease, discovering that he suffered from a troubled and abusive childhood that resulted in the murder of his father and his growing mental illness that he portrayed in the paintings. Under orders from Rhodora to ensure the rarity of the paintings, gallery worker Bryson transports half of the paintings to storage. While transporting them, out of curiosity, he opens a crate and decides to keep one of the artworks for himself. En route, he accidentally crashes his car when lit cigarette ash disposed on a painting causes severe burns. Retreating to a gas station, Bryson is attacked by a painting of monkeys fixing a car and goes missing, as do the artworks. Jon Dondon, a rival art gallery owner, attempts to tell Dease's story to the press but is soon murdered when a mysterious hand hangs him by his scarf. Rhodora's former assistant, Coco, who had just begun working for Jon, discovers his body the next morning. After Jon's funeral, Morf notices a hand in a Dease painting suddenly move, causing him to be overwhelmed. Morf and Josephina's relationship declines due to Gretchen telling Josephina that Morf still cares about Ed, and Gretchen telling Morf that Josephina is having an affair with Rhodora's latest client, Damrish. Morf also discovers that Dease used blood in his paintings while Gretchen negotiates display of some of Dease's collection in the city gallery; in exchange, the city gallery will display an interactive piece called Sphere that is owned by Gretchen's primary client. After a meeting with gallery owners, Gretchen sticks her right hand in one of the holes in Sphere (a prime feature of the piece that guests would do themselves). When she does so, the piece malfunctions and her arm is severed, resulting in significant blood loss. The next morning, visitors mistake her dead body as part of the artwork and walk past it, before Coco discovers her body and calls the police. Despite Gretchen's death in the same gallery, there is a spike in interest and demand for the Dease exhibit. Morf and Josephina break up after he finds out about her infidelity. Morf's mental state begins deteriorating when he experiences hallucinations and urges Rhodora to stop selling Dease's artwork after discovering the artist left strict instructions to destroy it. Morf hires Coco as an assistant to dispose of the artworks, and Coco reveals that Ed was paid by Rhodora to show her Morf's initial reviews in order to know which artworks to purchase. After breaking up with Damrish as he decides to not have his pieces in a gallery, Josephina is supernaturally transported into a gallery, where the graffiti-like paintings melt around her and cover her skin. Whilst pulling the Dease artwork he owns out of storage, Morf is attacked by Hoboman, a robotic art piece that Morf critiqued, and his neck is snapped. Coco finds Morf's body while Josephina's frightened image is shown to now be on a graffiti wall. Rhodora becomes nervous and takes her Dease painting off the wall, but a brush with death leads her to accept that the numerous deaths are connected to Dease's work, and she has artwork of all kinds in her house removed to ensure her safety. However, the buzzsaw tattoo on her neck animates, spinning and slashing her fatally. In a taxi, Coco, headed to the airport, passes a man on the street selling some of Dease's paintings. Meanwhile, Piers, who has moved away to a beachside house, is seen drawing curving lines on the beach as the waves wash over them. It's set in the world of contemporary art in Los Angeles, and its got a Robert Altman-like large ensemble cast. It's got a The Player vibe to it. There's a large cast and we're moving around from person to person as we move through this world. The story is being told through these different characters. 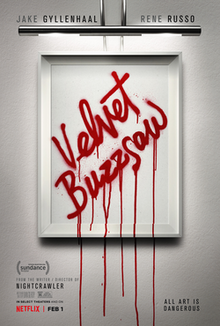 In January 2018, it was announced the title was Velvet Buzzsaw. In March 2018, Zawe Ashton, Natalia Dyer, Tom Sturridge, Daveed Diggs, Toni Collette, John Malkovich and Billy Magnussen joined the cast of the film. Marco Beltrami and Buck Sanders composed the score for the film, replacing Gilroy's frequent collaborator James Newton Howard. Velvet Buzzsaw had its world premiere at the Sundance Film Festival on January 27, 2019. It was released by Netflix on February 1, 2019. On review aggregator website Rotten Tomatoes, 65% of critics have given the film a positive review based on 139 reviews, and an average rating of 6.2/10. The website's critical consensus reads: "If you only watch one art-world satire with horror overtones this year — or most others — it should probably be Velvet Buzzsaw." On Metacritic, the film has a weighted average score of 61 out of 100 based on 28 critics, indicating "generally favorable reviews". Brian Tallerico of RogerEbert.com gave the film 2.5 out of 4 stars, saying: "It's a wildly inconsistent film, sometimes disappointingly clunky and as superficial as the world it's mocking, but it's also an ambitious piece of work with unforgettable imagery and an ace ensemble." Emily Yoshida of Vulture wrote: "Writer and director Dan Gilroy is drawing from the same well of a bitter, morally compromised Los Angeles that he did for 2014's Nightcrawler, but Velvet Buzzsaw, as gleaming and sun-drenched as Nightcrawler is dark, is even more of an invective, and even more operatically heightened." Peter Debruge of Variety called it "[Gilroy's] most cynical movie yet, with most of the venom concentrated in the character of the critic." David Ehrlich of IndieWire gave the film a grade of C, saying, "Gilroy's film needed to be 60% better or 20% worse in order to transcend the forgettable silliness of its existence, but it could stand the test of time as a lasting monument to the idea that our own personal taste is the only real thing we ever had." ↑ "Velvet Buzzsaw - Netflix Official Site". Netflix. Retrieved December 15, 2018. ↑ Film and Television Tax Credit Program Program 2.0 (PDF) (Report). California Film Commission. p. 9. Retrieved October 4, 2018. ↑ Patches, Matt (February 1, 2019). "How Tim Burton's failed Superman movie inspired Netflix's new thriller Velvet Buzzsaw". Polygon. Retrieved February 1, 2019. ↑ Fleming Jr, Mike (June 20, 2017). "Hot Package: 'Nightcrawler's Dan Gilroy, Jake Gyllenhaal, Rene Russo Reteam". Deadline Hollywood. Retrieved March 12, 2018. ↑ Fleming Jr, Mike (June 26, 2017). "Netflix Wins Dan Gilroy Film; Jake Gyllenhaal & Rene Russo To Star". Deadline Hollywood. Retrieved March 12, 2018. ↑ "The director of 'Nightcrawler' gives details about his upcoming Netflix movie starring Jake Gyllenhaal". Business Insider. Retrieved 2018-03-12. ↑ Marc, Christopher (January 14, 2018). "EXCLUSIVE: Dan Gilroy's Next Film Is Titled 'Velvet Buzzsaw'". Omega Underground. Retrieved March 12, 2018. ↑ Kroll, Justin (March 12, 2018). "Netflix's Dan Gilroy-Jake Gyllenhaal Film Sets Ensemble (EXCLUSIVE)". Variety. Retrieved March 12, 2018. ↑ Hipes, Patrick (March 12, 2018). "New Dan Gilroy-Jake Gyllenhaal Movie Finalizes Cast". Deadline Hollywood. Retrieved March 17, 2018. ↑ "Dan Gilroy & Jake Gyllenhaal's Netflix Film Sets Ensemble Cast". Netflix. March 12, 2018. Retrieved March 12, 2018. ↑ Debruge, Peter (November 28, 2018). "Sundance Film Festival Unveils 2019 Features Lineup". Variety. Retrieved November 28, 2018. ↑ "Velvet Buzzsaw (2019)". Rotten Tomatoes. Fandango. Retrieved February 10, 2019. ↑ "Velvet Buzzsaw Reviews". Metacritic. CBS Interactive. Retrieved February 10, 2019. ↑ Tallerico, Brian (January 28, 2019). "Velvet Buzzsaw". RogerEbert.com. Retrieved January 28, 2019. ↑ Yoshida, Emily (January 28, 2019). "Velvet Buzzsaw's Art-World Evisceration Is Pleasantly Perverse". Vulture. Retrieved January 28, 2019. ↑ Debruge, Peter (January 28, 2019). "Sundance Film Review: Jake Gyllenhaal in 'Velvet Buzzsaw'". Variety. Retrieved January 28, 2019. ↑ Ehrlich, David (January 28, 2019). "'Velvet Buzzsaw' Review: A Silly But Toothless Satire of the Art World — Sundance". IndieWire. Retrieved January 28, 2019.